Perhaps the most important point in this training for mass program I am about to present is the need to establish the right balance between effort and rest. I mean not only the seconds or minutes between sets, but also the days of rest between workouts and their proper distribution in the course of a week's work. Add to this the basic biological night's sleep, and you have put down a foundation for what I think is a real good way to boost those muscles into a higher stage of development. It's hard to knock off whole days of rest when you see Arnold and Franco and Zane going at it every day with their own routines. You get this compulsion to work, and you hate to let a day go by. You've probably felt the same way in your own training. However, before long, on this mass routine, you'll learn to appreciate the need for rest. You build up on and get into the heavy systemic moves like squats and rowing motions with the barbell, and you've opened the gates on your reservoir of energy. It's very easy to overdo these big ones, so listen carefully. That doesn't mean you can get away with only four or five sets on a muscle group. That ancient concept was okay for getting "bulk," the kind of size you got by "stuffing the goose" - force-feeding yourself with everything in sight - but it's not that way any more, and it shouldn't be. Neither does it mean you can do a lot of heavy sets. If you have been training hard for five years or so, you might get away with a high number of heavy sets for a while, but for optimum results I believe 10 to 12 sets on a muscle will keep you from going out of bounds and overworking. Growth simply won't take place without sufficient rest. If you overwork, you can go nowhere and even backslide. Your muscles become 'shocked' and get mulish, absolutely refusing to respond. The wasted time can seem disheartening. After ten years of heavy training I've arrived at some facts of life. I have found that the best system for building quality mass is a four day a week program, hitting each muscle group twice a week. Calves, which are worked each session, are the only exception. With this routine you rest three full days a week. 1) Set your goal. What will give you the look you want? 15 . . . 20 . . . 30 pounds? That means solid muscle, not fat. 2) Heavy training builds more lasting muscle. "Pump artists" deflate with a two-week layoff. Guys who go heavy show little appreciable loss in muscle size after a few weeks away from training. 3) Heavy leg work is paramount. The full squat is the basic mass builder for the thighs. You will work calves every training day to keep pace with the thighs. Monday and Thursday: Legs, Chest, Back. Tuesday and Friday: Abs, Shoulders, Arms. This is my favorite calf growth exercise. (If you train alone you will have to substitute another exercise or rig something up). Point your toes straight ahead with just the balls of the feet on a four-inch block. Raise up as high as you can on the toes and lower the heels as far down toward the floor as you are able. Do 15 full repetitions, then do another 5 reps of "burns" by going half way down and then half way up, staying in the top half of the movement. This keeps the calves under continuous tension. The exercise is more effective if your partner (or the weight) sits more toward the hips, rather than the lower back, so that more stress is placed directly above and onto the calves. 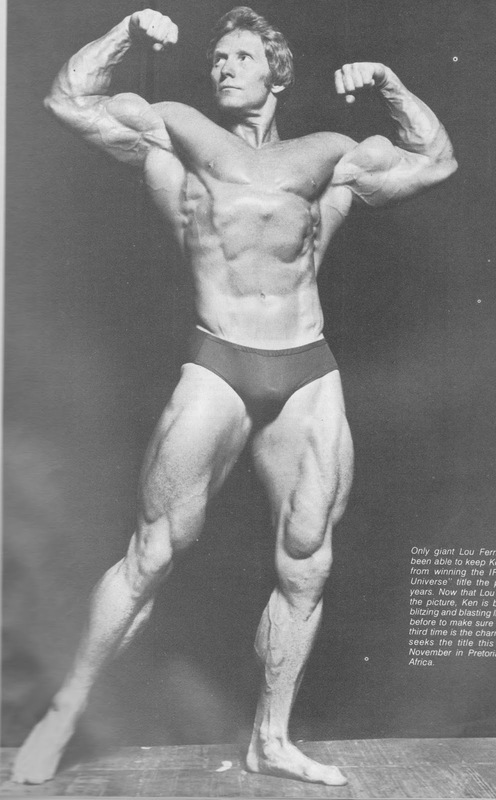 Unquestionably the greatest thigh builder of them all. For a warmup, do about 10 freehand squat to stretch the muscles and warm up the knees. Now go to a weight that you can do 12 reps with. This first set is still part of the warmup, so don't use maximum poundage. After a one or two minute rest, add weight to the bar and do 10 reps. Continue adding weight each set as you do 8 reps, 7 reps, and 6 reps. Add more weight and do 2 sets of 5 reps. This totals up to 7 sets. Keep the bar high on the back of the shoulders and keep the back straight so the thighs get all the work, rather than the back and buttocks. Adds that sweep to the back of the thighs by developing the hamstring muscles. When performing this exercise be sure to keep the body flat against the table at all times. If the hips are allowed to raise up as the legs are curled, the movement in less effective. 5 sets of 12 reps, resting no more than one minute between sets, will do the job. It is wise to prepare the upper body muscles with a light warmup before engaging them in heavy training. I have found that doing 2 sets of 10-12 reps of chins and parallel bar dips (done superset style) is an excellent warmup for all the upper body muscles. Diving straight into heavy upper body work without a warmup is just plain stupid and it can lead to nagging injuries that retard your training progress for weeks and even months. Don't overwork on the chins and dips by trying to go all-out for maximum reps. They are being used as a warmup. Builds great size and adds strength. Using a medium-wide grip, start out with 12 reps on the first set. Lower the bar to the highest point of the chest, then ram it back to the starting position. Add weight each succeeding set for 10, 8, and 2 sets of 6 reps. Rest one to two minutes between sets. Thickens the upper pec area and creates a fuller tie-in with the delts. Since your chest is already warmed up from the bench presses, start right out with the heaviest dumbbells you can handle for 8 reps. Do 5 sets of 8 reps. Rest only as long as needed to recuperate for the nest set - usually about 60 to 90 seconds. This exercise builds wide lats and adds size to the upper portions of the back near the shoulders. Since the back has already been warmed up, start right out with as much weight as you can handle for 8 good reps. Use a wide grip and pull the bar down until it touches the back of the neck at the shoulders; let the bar go back up slowly all the way to the top for a full stretch. Blase out 5 sets of 8 reps, resting no more than one minute between sets. 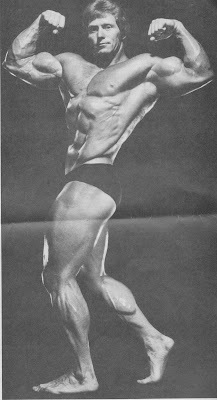 This great movement works the entire back from the lats an traps all the way down to the erector muscles. Use a fairly wide grip and be sure to keep the back flat and parallel to the floor throughout the entire movement. Do the exercise as strictly as possible so that the back gets the work rather than the biceps. In fact, try to relax the biceps and think of the arms and hands only as hooks as you pull the bar up and lower it. Do 5 sets of 8 reps with as much weight as you can handle, resting about one minute between sets. Finish off with one of MAXIMUM reps of chins and one of dips. That's it for today. If you don't have a Roman Chair, sit on a bench and hook your feet securely under a heavy barbell. A piece of foam rubber placed between the bar and the feet will make this a lot more comfortable. With the hands clasped together behind the head, lower the upper body down until it is parallel to the floor - never lower than this - then exhale as you come all the way forward while trying to touch the head to the knees for a full contraction. Do one set of as many reps as you can - work up to 50. Keeping the legs partially bent works the abdominals better and reduces assistance from the hip flexors. Keep your chin on your chest and exhale as the legs are raised up until the toes point at the ceiling. Do one set of maximum reps; work up to 50. Do the reps slowly so you can really feel them. A broom stick or an empty bar can be used for this oblique tightener. Bend forward so that the body is parallel with the floor with the stick on the back of your shoulders and your feet wide apart. Now twist as far as is comfortable to the left - try to touch the left foot with the end of the stick - then twist all the way to the right. Keep this up until you have done 50 reps for each side. That's it for ab work. Two supersets of 10-12 reps of chins and dips. This exercise can really put muscle on your shoulders when you do it my way. Use a shoulder width grip. O prefer to do this one standing because I can handle more weight this way. Do not push-press the weight or use a lot of back bend. Use the following repetition scheme: 10 reps; add weight and do 8 reps; add weight and do 3 sets of 6 reps. Rest one to two minutes between sets. I prefer to clean the weight to the shoulders at the start of each set, but you may wish to take the bar off squat racks to conserve energy. 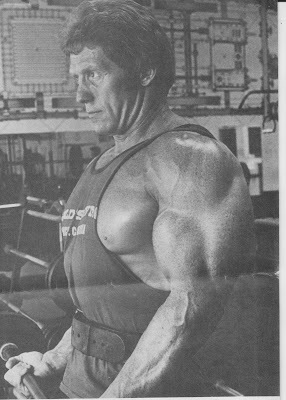 When you use a very wide grip, this not only builds the delts, it helps widen the entire shoulder girdle. It's a great structure building exercise. Do this one seated. Take the weight off a rack and jerk-press the bar overhead as you sit down. Now, starting the first rep from the top, lower the bar behind the head until it touches the base of the neck; ram it back to the top and repeat for a total of 5 sets of 6 reps. After completing the last rep of each set, lower the bar very slowly to the shoulders before returning it to the racks. Good for the advanced man as well as the neophyte. Using a straight bar with hands spaced about 12-14 inches apart, curl the bar up to the shoulders and flex the biceps at the top; lower slowly and repeat for 5 sets of 8. On the last couple of sets it is permissible to cheat out the last 2 or 3 reps because your biceps will be tired. But don't overdo it. Use just a slight swing to get the bar moving and only on the last 2 or 3 reps of the last 2 sets. One minute rest between sets should be sufficient. Adds height and shape to the biceps as well as building size. Sit on the end of a bench and grasp a dumbbell with the elbow and lower triceps braced against the inside of the thigh near the knee. This gives you a fulcrum for handling more weight without cheating. Curl the bell up until it touches the deltoid and tense the biceps hard at the top; lower slowly and repeat for 5 sets of 8, alternating the right and left arms and resting about 30-60 seconds after a set for each arm. Just go from a set for one arm to a set for the other, then rest 30-60 seconds. Don't be afraid to work up in weight with this one. 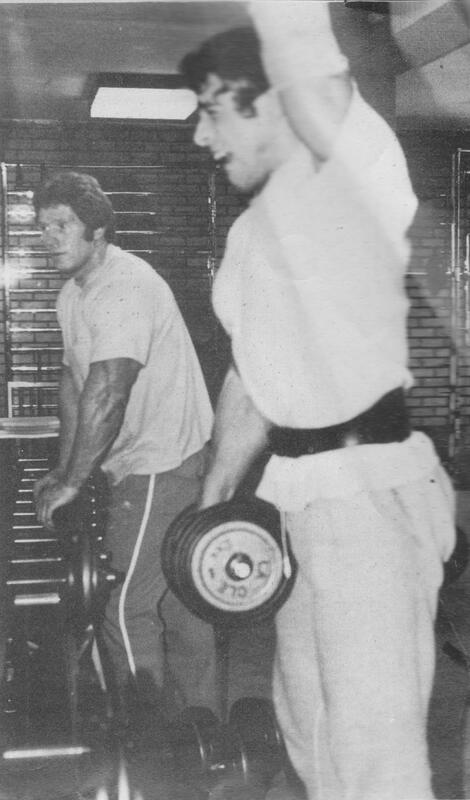 Your biceps can be trained to generate tremendous strength if you keep pushing the poundage up (Franco and I worked up to a 110-lb. dumbbell for 3 reps). Don't cheat on this movement, but do work as heavy as possible at all times. You won't get quality mass unless you handle heavy poundages. This is my favorite exercise for massive triceps. I prefer to use an EZ bar and do it with my back braced. 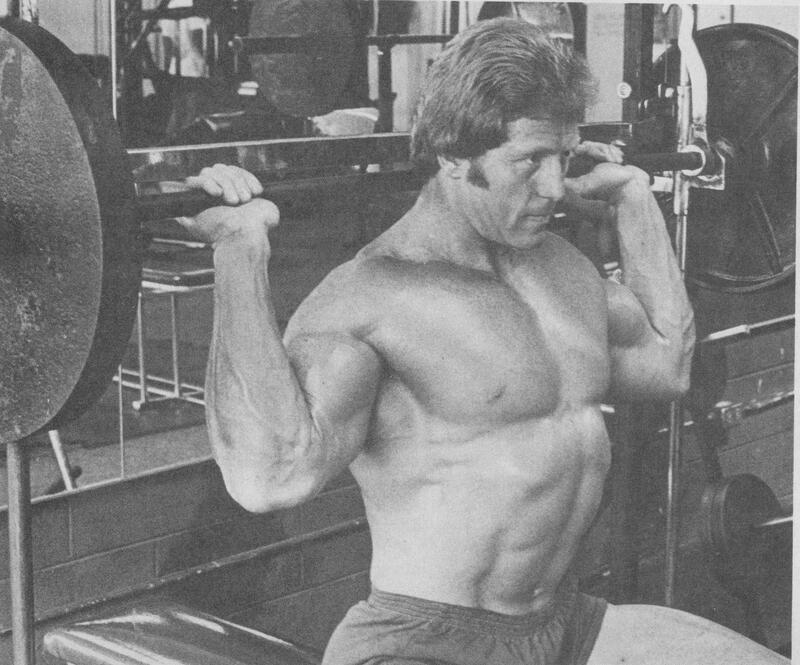 Keeping the elbows pointed straight up - never let them move out toward the sides - the bar should be lowered as far as possible behind the head; straighten the arms to full lockout and repeat for 5 sets of 8, resting about 60-90 seconds between sets. I like to brace the arm that is working with the back of the opposite hand. Keep the elbow pointed toward the ceiling as you lower the dumbbell as far as you can/ return to the top by straightening the arm to full lockout. The first three sets do 8 reps, and 6 reps on the last two sets - a total of five sets. Start with the right arm first, then go immediately to the left arm before resting 30-60 seconds. with two sets of maximum rep pushups with the feet elevated on a bench and the hands about 8-10 inches apart. Shower time. Feet Elevated Close Grip Pushups, 2 x max. Like everything else in this life, you get out of it what you put into it. You probably can't name any other activity where its members so glaringly wear the results of their efforts as they do in bodybuilding. Maybe the sport of alcoholism. Pretty easy to spot an advanced competitor. I knew a guy who was addicted to the sounds of drinking, not the drinking itself. Oh, he'd make up some excuse to get away from it all, then head out of town to somewhere off the grid, some nice quiet treed area where he could just stand there and imagine that audio addiction of his. The hills were alive with the sound of boozing, you might say. Right now he's working as a bartender in some crummy dive and no one can figure out why he's so happy all the time. If you want something bad enough you can usually find ways of getting it. If you want muscle mass, you can get it - providing you are strongly motivated for a long enough period of time. Here's a premise for you. Go at it with a clear picture of what you want to be. Imagine your goal, then strive for it with all you've got. Connect your brain to your muscles. Think! Make every rep count. You have to, because you've only got six or eight reps to work with on most sets of this routine. Leave your worries at home. Put them in your driveway and back over them with your car as you leave for the gym. Get to sleep. If you lie there staring at the dark ceiling, check yourself for overworking. Keep it up long enough and they'll be checking you in. Eat muscle building foods. Meat, fish, fowl, eggs, and don't neglect the grains, fruits and vegetables. Try three meals a day and a snack or two in between, but don't be led to believe that 'bulk' eating will 'force' quicker muscle growth. You'll wind up with the same amount of muscle and a layer of lard. Eat like hog, look like pig. Keep it simple, keep it clean and direct, and stick with this layout long enough to work into some heavy weights.